WEN 5613K : Reliable, well-built and affordable. (Buy from Amazon). When disaster strikes it can leave you powerless. A heavy-duty generator can restore a sense of normalcy when a storm sweeps through and leaves you in the dark. 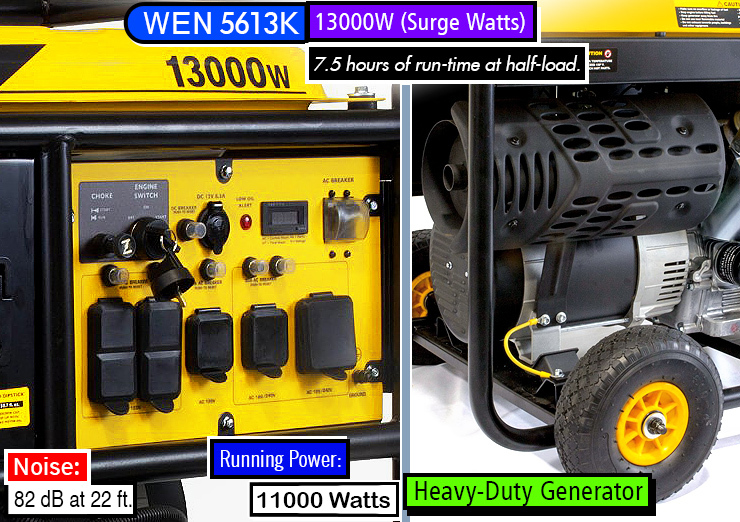 The WEN 5613K 13000-Watt (13 Kw) generator can supply your home with sufficient power for the things you need. If you have ever been without power then you know what a disruption it can cause to your day. Why Invest in the WEN 5613K Generator? A commonly asked question people ask when considering a standby generator regards the size. How many watts do you really need and what will it power? Portable generators in the 5-10 kilowatt range are suitable for occasional use to run a few essential appliances or even tailgating events when you want to run a radio or TV. When you are out of power for days at a time, however, you need something with more power capability. 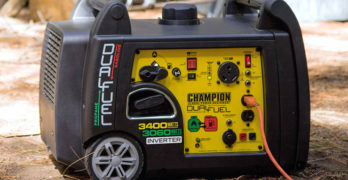 Many homeowners don’t give much thought to purchasing a portable generator until they have to. The problem with this is you’re left to pick from whatever the store has in stock, if you’re that lucky. A natural disaster or even a sudden storm can leave you without power for a few hours to a few days on end. Being prepared ahead of time with the right generator for your home will make a bad situation much easier to deal with. A power outage lasting for several hours or days will have a significant impact on your daily activities when you factor in everything you rely on electricity for. A 13,000-watt generator can power your electric hot water heater so you can take a hot shower or even a central air conditioning unit to keep you comfortable. A portable standby generator of this size has the capacity to take on larger loads so you can run the things you need and then some without having to make major improvisations. You’ll be able to run multiple small kitchen appliances such as an electric burner or coffee pot in addition the larger essentials like a refrigerator or freezer. Cost is another factor that many take into consideration when shopping around for a generator and understandably so. After all, how often do you expect you’ll use it? The fact of the matter is when quality and durability is what you want you should make careful consideration. The best heavy-duty generators will cost you a little more upfront, but there is important value to be had. Many of your best brands, like the ones mentioned here, are loaded with important features that are worth that extra expense. These generators go above and beyond just giving you a backup power source. They’re specifically designed to last at optimal performance so you get reliable backup when you need it for better peace of mind. NEVER use a generator inside homes, garages, crawlspaces, or other enclosed areas. Carbon monoxide can build up in these areas and can potentially kill you or cause serious health issues. Using a fan or opening windows and doors does NOT supply enough fresh air. Never use a gas generator indoors. ONLY use a generator outside and a long distance from windows, doors, and vents. Openings in your home can pull in generator exhaust. This will help you survive and/or work through tough conditions. EPA III 4-stroke OHV twin-cylinder engine produces 13000W starting watts and 11000W rated watts. Includes : Four 120V (20A) outlets, one 120V (30A) RV outlet, one 120/240V (30A) twist lock, one 240V outlet, and one 12V DC car-charger-style outlet. Well-suited for construction sites, natural disasters, and power outages. 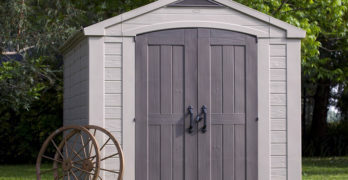 Includes wheel and handle kit which makes it easy to move and store. Fuel Capacity : 8 gallons; 87 octane minimum. ✓ View or download the MANUAL for the WEN 5613K. You also have the mobility factor with a portable generator that can allow you to take it along if needed. The WEN 5613K generator comes with a wheel kit and handle and includes all of the necessary tools for assembly. This provides easier mobility for transporting the 330-pound unit around with a fold-down handle for convenience when storing it. The portability that these generators provide gives you greater versatility than a stationary generator with almost the same amount of power. You can use it as backup for your home or take it with you for road trips to power up your second home – an RV! If you’re not the ‘roughing it’ type but still enjoy RVing then a generator will be your best friend. Powered by a reliable 670cc engine : EPA III, 4-stroke OHV twin-cylinder. The WEN 5613K can be connected to your camper to run the RV air conditioning unit, RV fridge, TV, heater radiant, electric grill and even a microwave plus more all at the same time. This powerhouse is also a slightly compact design when compared to the dimensions (32.5”L x 23.6”W x 27”H) of other models of its kind; an important element when storage space is a factor. Not to be confused by the two numbers you see referring to this generator’s wattage, it puts out a surge power of up 13,000-watts and is rated for 11,000 continuous watts. Many appliances require a higher wattage as much as 6 times higher to start than they do to run, so it’s important to know what your appliances and devices require. For instance, a typical refrigerator requires 2100 watts for starting and this lasts a few seconds, then only 700 watts to run continuously. Before you think 13,000watts is more than what you need, be sure you’re factoring in the starting watts of each appliance that would be applied to it. When the power goes out this can power your home. This generator is equipped with a 4-stroke OHV twin cylinder motor with 22 horsepower, so the better question to what can it do is what CAN’T it do. The fuel consumption of the motor at full load is 2.14 gallons per hour. The 8-gallon fuel tank will run for up to 7.5 hours while running at half-load; Powerful enough to keep your refrigerator, freezer and even a couple of window A/C units running through the night until early morning before needing to refill the fuel tank. Purchasing a generator is akin to buying home insurance, or any type of insurance when things go wrong, you’ll be covered. Why invest in a generator? For peace of mind. In the case of a generator, it has a wide range of uses so it’s never a waste of money. One basic thing, if the power goes out for a long period of time all of the food in your refrigerator will go bad. That alone will likely cost hundreds of dollars.You have to think about the risks of losing power and what you might lose if the worst case scenario happens. The WEN 5613K also features an electric start for faster and easier start-ups with the battery included with the generator. There are 7 total outlets on the unit’s console which include four 120V 20A outlets, a 120V 30A outlet for RVs, a 120/240 30A twist lock, one 240V outlet, and a 12V DC car charger-style outlet. You can safely and conveniently charge external batteries with this bad boy giving you a great selection of versatile options for usage compared to other models in its class. ✓ TIP : Never place any type of storage cover on the generator while it is still hot. Please read the entire manual before using any generator. One of the vital elements to protecting your genset from damage is by ensuring proper care and maintenance are followed. This can be a tedious process, because you have to regularly check levels and keep track of maintenance duties so they don’t go undone. The generator has several safety features that help to protect the motor for longer lasting quality so you get more out of your investment. Air-cooling system – This helps to keep the engine of the generator from overheating while running. Hour/Voltage Meter – a meter on the control panel displays the voltage and amount of hours the unit has been running for. This is an important feature to keep track of maintenance responsibilities; for instance, the oil should be changed every 8 hours, 25 hours, and 3 months or more frequently under heavy loads. Low-oil shut off – this feature will automatically shut down the generator to prevent damage to the motor when the oil level gets below a certain point. **As previously mentioned, the genset can be connected to your home for standby power; however, this should only be performed by a qualified technician ONLY. 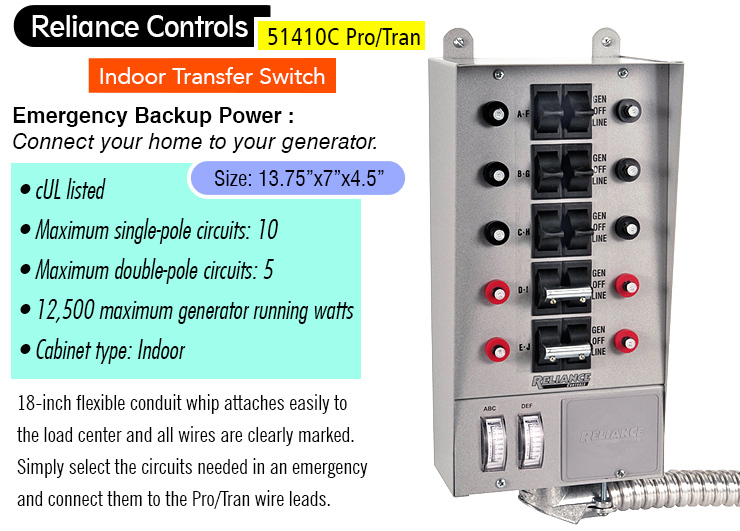 You’ll need to be aware of the starting/running watts required for all appliances that will be connected to it through the transfer switch to avoid overload once the power switches over to the generator. Overloading a generator can cause damage to the motor as well as to your appliances. It is not recommended for use with sensitive electronics like a laptop. The WEN 5613K generator is an EPA-certified engine that meets the standard regulations on emissions; although it is not CARB-compliant. The motor is also equipped with a muffler that helps minimize the noise output of the engine. With a rating of 82 decibels from 22 feet away, that’s about the equivalency to the sound of city traffic from within a vehicle. There are many features and aspects of the WEN 5613K generator that make it very user-friendly for homeowners. It is durable and built to last with proper care and maintenance by the consumer. By comparison, the Yamaha EF12000DE and the Subaru RGV12100 are great alternative choices for best heavy-duty portable generators. Learn more on the WEN site. ✓ NOTE : Generator can run at its surge wattage capacity only for a short period of time. 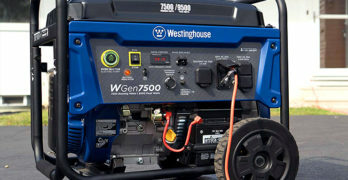 Connect electrical devices requiring a rated (running) wattage equal to or less than the rated wattage of the generator. DO NOT connect electrical devices requiring a rated wattage equal to the surge wattage of the generator. This can trip the circuit breaker. Industrial generator for any situation. OHV engine (overhead valve) — Heavy-duty design — better efficiency, improved reliability and quiet. Cast iron cylinder lining — Optimal heat dissipation. Long engine life. Oil Watch Warning System — Automatically shuts off before oil level gets low. Oil must be added before it will start again. Prevents engine damage. Auto Voltage Regulation — Always the right power delivery even when using extension cords. Transistor Controlled Ignition (T.C.I.) — Clean, efficient spark makes for fast, easy starting. Auto decompression — Automatically “opens” exhaust valve to reduce initial back pressure when starting. Fast starting. USFS-approved spark arrestor — Quiet operation and prevents sparks from exiting exhaust system, reducing chance of fires caused by flying sparks. GFCI — Ground Fault Circuit Interruption shuts off power when it senses a leak to ground. Greatly reduces risk of electric shock. Fuel gauge — Monitor how much fuel is left in real-time. No guessing. Wheel kit — Easy to move around. 79.2 / 100.0 amps @ 120V – 39.6 / 50.0 amps @ 240V dual voltage output. The EF12000DE is engineered to handle just about anything during a power outage. Highest Yamaha output gasoline-powered (120/240- volt) output generator. Twin-cylinder 653cc, 4-stroke, OHV engine. Delivers 12,000 watts maximum AC output. Electric start (battery not included). Compact and very portable. Provides 8 hours of continuous operation at rated load without refueling. Designed to power super heavy-load equipment such as: well pumps, air compressors, table saws and more. Oil warning system : Engine stops automatically when oil level (pressure) has fallen below the prescribed level. Noise Level : 77dB at 7 meters. A power outage isn’t the only occasion where owning a powerful portable generator can be useful. Next in the lineup for best heavy-duty generator within the 11,000 to 14,000-watt range is the Yamaha EF12000DE. With a maximum AC of 12,000-watts, this 120/240V generator offers the greatest output fuel-powered portable generator of its kind by Yamaha. This beast was designed to handle nearly anything with incredible power and long lasting run time. It’s a great and essential machine to have for construction workers that rely on some source of electricity for their power tools. Easy to read control panel. Excellent build quality. Construction workers and industrial jobs often require high demand power tools that need some form of electricity to work; however when you’re in a construction site electricity can be scarce. A portable generator of this size is absolutely necessary to get the job done. The 4-stroke OHV engine delivers precise valve actuation to provide efficiency and a quieter-running motor than other like-models. It is rated at 9,500 continuous watts and offers dual voltage operation for greater versatility with auto voltage regulation. What does that do exactly? The auto voltage regulation feature is really beneficial when you’re using an extension cord. Construction workers don’t just work in one spot. They’re constantly moving and so are their tools, therefore extension cords are used to allow greater flexibility. The auto voltage regulation feature can ensure the correct delivery of power when operating even with use of extension cords. At the rated wattage, the unit can run on a full 11.4 gallon tank for up to 8 hours! 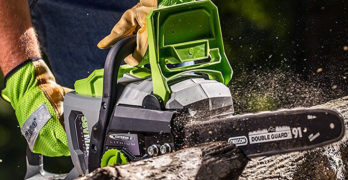 That will get you through the work day to power up those tools like an air compressor, hand drill and other tools simultaneously. There are a total of 5 receptacles including two 20A 125V outlets, a 30A 125V twist-lock, a 30A 250/125V twist-lock, and a 50A 250/125V twist-lock. This genset was designed for fuel efficiency with smart features that make it easier and convenient to use. Economy idle puts the unit on idle when there is no load applied to it so it’s not running uselessly in between your work. This can help you save time as well as gas where you’re not having to turn off the unit each time you’re done with one tool only to have to start it up again when you need it for another. A fuel gauge allows users to monitor the level of fuel in the tank so you’re not left to guess when it needs to be refilled. 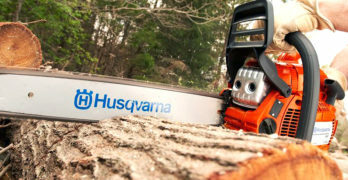 Additional features provide greater ease-of-use on the job as well as homeowners. The wheel kit makes transporting easier with rugged heavy-duty wheels that can take on all-terrains and a transistor controlled ignition ensures clean spark providing a low maintenance factor. This model is designed with cast iron cylinder lining to provide better heat dissipation as these units can become very hot while running. It’s also designed to minimize the noise output of the motor as well as reducing interference with electrical devices such as radios or TVs. Oil warning system – this system is designed to automatically shutdown the generator when oil reaches a certain level so as not to damage the motor. Better yet, it won’t restart until you add more oil to the tank as an added safety measure. Ground Fault Circuit Interruption – this feature helps protect against the risk of electric shock by shutting down the generator if a leak is detected to ground. AC non-fuse circuit breaker – if the generator becomes overloaded, this feature protects the AC circuit and the appliances that are connected to it. 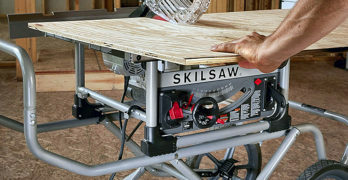 If several people are using tools or appliances connected to the generator, an overload is a very real possibility so this is a great valuable feature to have. This heavy-duty generator is equipped with many features that help to protect the engine to give you reliability for big jobs that demand it as well as homeowners that need it. ✓ For a smaller Yamaha industrial generator consider the Yamaha EF6600DE (6600W Starting/6000W Running). Heavy duty generator for construction and industrial users. * I should point out that the Yamaha EF12000DE and the Subaru RGV12100 are identical generators. Pick the cheapest one because they have the same features. The professional-grade control panel features Ground Fault Circuit Interrupter (GFCI) receptacles, twist-lock, circuit breaker protection and gauges for tracking operational requirements. A built-in hour meter tracks the unit’s run time to make preventative maintenance scheduling easy. View or download the OWNERS MANUAL. View or download the Subaru BROCHURE. Subaru manufactures its own line of industrial portable generators that are trusted among professionals and homeowners alike. The RGV12100 is constructed with a heavy-duty tubular steel frame for durability. It’s also equipped with valuable features to make your money stretch further with better fuel efficiency and environmentally- friendly factors. An industrial air cleaner element is designed for heavy-duty use and can be cleaned and reused to save money on replacements. Who doesn’t like saving money? Low oil shutdown that shuts off the engine when low oil level is detected. Let’s get straight to what really matters. How powerful is it and what will it run? Similarly to the other modems mentioned, the 22HP EH65 OHV engine provides a maximum output of 12,000 watts and 100 amps. This is sufficient to power up your central A/C unit, a refrigerator or freezer, and several lights. It also contains an 11.4 gallon fuel tank that will run for a little over 8 hours of continuous use. This means your food will still be good when you wake up in the morning AND you can run your coffee for that first cup of coffee you need to start your day. The Subaru RGV12100 is designed for quieter operation even at full load with a low-tone muffler with spark arrestor, making it a little friendlier to your neighbors. Typically, the more power a gas-operated generator puts out the greater the noise output, which can be a concern in some areas. With a dba rating of 77 at 22 feet it is just slightly louder than the rate of normal conversation, yet quieter than the WEN 5613K. The control panel is very intuitive making it easy to use. It also has electric start for easy startups simply by turning a key, although the battery required for this feature is not included. Outlets include a 120V 20A duplex, a 120V 30A twistlock, a 120/240V 30A twistlock and a 120/240V 50A twistlock. Hour meter – This allows consumers to keep track of operating hours of the unit as well as important maintenance levels to help keep it operating at its best. Low-emission engine – The muffler is equipped with spark arrestor that is US Forestry-approved to provide safety. Fuel Tank Strainer – the innovative design of the metal fuel tank contains a strainer cup that prevents dirt and water from entering the engine for extended running times and prevent damage. The durable features and construction of this unit provide a well-built generator that can take a beating and at a hefty weight of 329 pounds when empty. The included wheel kit makes moving it around a lot easier so you can store it away when it’s not needed. Learn more about the RGV12100 on the Subaru site. The best heavy-duty generators provide exceptional performance when you need it most whether it’s to power your home during a blackout, run an RV for a camping trip, or to power your tools for big jobs. The WEN 5613K (13 Kw) generator is an incredible machine that ranks top in our lineup of standby portable generators to meet these needs and more. It is ideal for both homeowners and professional industrial use with reliable power and key features at a valuable price.